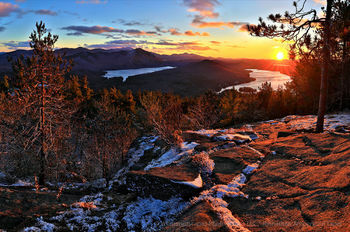 "Silver Lake Mt summit view over Whiteface, Catamount,Taylor Pond and Silver Lake in November"
'Print Only' is the ordering option to choose when planning to traditionally frame the image yourself locally. Each print is an archival quality inkjet print using professional-grade lustre papers and inks rated to 100 years, and will be shipped to you directly from my professional printers' rolled in a tube. Shipping is free for print-only orders within the USA, and at-cost for international orders. Notes: Size in inches represents the image's longest side; the other side changes proportionately. Lettering nomenclature after size is for internal sizing categories only. 'Plaq Mounted' is a modern frameless mounting option in which an archival inkjet print is mounted onto a wood backing board and coated with a clear UV protective finish for fade, water, and scratch resistantance, and hangs directly and flush on the wall as is, for a superior colorful, sharp, and glass- and glare-free image to be enjoyed for decades. Thickness of mount is 3/8" thick for 60" and smaller, 1" thick for 78" and larger, by default, and hangs via a screw-head keyhole slot or french cleat, included. 90% of customers choose this option. Wildernesscape images are most impressive as physical photographic prints, as their large format and photographic detail brings out a realism and sense of being there yourself that no computer monitor can convey. On a wall, prints also act as escape from the present to the natural world we call wilderness. We are all deeply connected to the environment in which we live, and I hope my photos and large-format prints can connect you ever more strongly. Print and mounting options listed here are described in detail on the Ordering Prints page. All images on this site are also available for stock image licensing, and I offer notecards, screensavers and other photographic services.